Arsene Wenger might have his naysayers from his tenure at the helm of Arsenal and this will not be an article to debate that. What Mr Wenger has delivered is consistent dining at the top table, but almost more importantly is the consistent fact that Arsenal have NEVER finished below Tottenham in his time in charge. The North London derby was one of our favourite derbies and of course it’s not just about the match itself, but the Premier League finishing positions too. Now on that fateful day that Arsenal can no longer be beaten by Tottenham in the Premier League, Gooners rejoice and celebrate the historic St. Totteringhams Day. Last night was the 19th season in a row that St. Totteringhams Day was celebrated as Arsenal are now 7 points ahead of Spurs with just two games remaining. In those 19 occurrences of St. Totteringhams Day, some have happened extremely quickly, others have happened agonisingly late and of course the best ones have had a little more to fight for than just the position in the league. So on this festive day I present to you, the 5 best St. Totteringhams Days from the recent 19 straight. 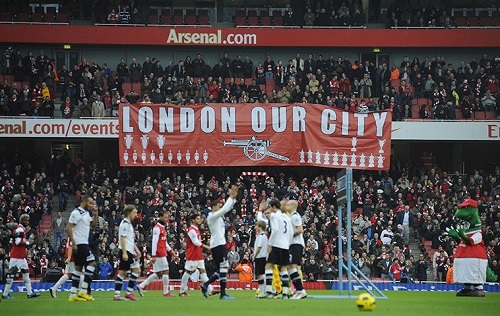 Enjoy it and remember that North London is most definitely Red! It’s a poignant place to begin the list as Arsenal went to White Hart Lane in 2007 and with a 2-2 draw managed to secure St. Totteringhams day. It took 35 games, by no means a quick one, but to seal it at the home of the enemy is something special. The Gunners finished fourth and qualified for the Champions League while Spurs would have Thursday football to look forward to! One of the four final day St. Totteringhams day celebrations in the Wenger era, last year this was a decisive one as Arsenal produced a sensational close to the season. It was settled when Arsenal beat Newcastle in a horrid game. Spurs fans added to the giddy excitement by somehow inventing a phantom goal for Newcastle and celebrated ironically for an embarrassing five minutes. Arsenal secured Champions League football again while Spurs were hurt by finishing fifth. Probably only better than 2013 because of the abuse Spurs fans had hurled at them throughout the season “Mind the Gap”. It became a battle for third, but the irony was that in Chelsea winning the Champions League, fourth place would mean Europa League. Spurs had led Arsenal by 10 points but in the run in it was the Gunners who caught up and then overtook Spurs including winning 5-2 against them. Arsenal sealed it with a crazy 3-2 win at West Brom while Spurs (you guessed it) would look towards Thursday night football again! The Invincibles season was as good as it got for Arsenal in terms of St. Totteringhams Day, 28 games of the 38 was all it took for the unbeatable Arsenal to be sure that the North London neighbours could not overtake them. Of course Arsenal won the league title that year as well importantly sealing the title and enjoying the celebrations for the second time in their history at White Hart Lane (More than Spurs have done in their entire history!). 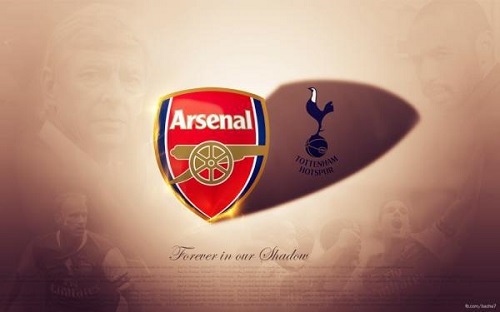 Spurs finished fourteenth then and were will and truly in the shadow of the great North London Club. Spurs had enjoyed a reversal of fortune under Martin Jol as the fiery Dutchmen crafted a competitive side that proved a tougher challenge than many of their predecessors in the Wenger reign. In 2006 it went to the last day of the season and the last ever game at Highbury where Arsenal started the day 1 point behind Spurs. Arsenal did their part in being inspired by Thierry Henry in a 4-2 win over Wigan Athletic and then heard that Tottenham had transpired to lose to West Ham and hand Arsenal the final Champions League spot. It was a beautiful afternoon saying farewell to Highbury and to crown it off a Happy St. Totteringhams day. Wishing all our Arsenal readers a happy St. Totteringhams Day! Enjoy some reaction already to the 2014 celebration. 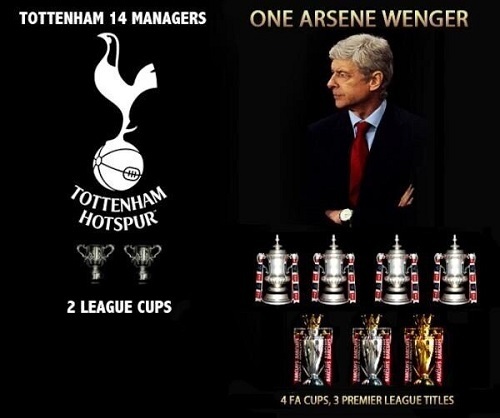 19 – This result ensures that Arsenal finish above Tottenham in the league for the 19th successive season. Gapped.